A provisional timeline of the arts in the city of Stoke-on-Trent. With an initial focus on the visual arts, institutions and groups, and major turning points. Started: 5th August 2014. Last updated: 21st November 2018. 1690s: The Eler brothers arrive in the Bradwell Wood, Stoke-on-Trent, to secretly use its fine red clay to develop new types of redware pottery. 1759: Josiah Wedgwood sets up in business in the Potteries. Artists and intellectuals, often highly eccentric, begin to form a small cluster around the Etruria Works and on the nearby Fowlea Bank. 1786: Josiah Wedgwood succeeds in making a new copy of the famous Portland Vase, symbolising that the British Empire had finally surpassed the best capabilities of the craftsmen of the ancient Roman Empire. 1790s: Thomas Wedgwood invents photography (all bar the fixative). 1792: Erasmus Darwin’s best-selling poem The Botanic Garden (1791, Part 1: “The Economy of Vegetation”) vividly celebrates the new industry and chemistry of the Midlands, comparing Staffordshire’s Etruria to peaks of ceramics making in past civilisations such as China and Etruria in Italy. 1844: Katherine Thomson (1797–1862), seventh daughter of Thomas Byerley of Etruria, publishes The Chevalier : A Romance of the Rebellion of 1745, partly set in North Staffordshire at the time of the Jacobite rebellion. 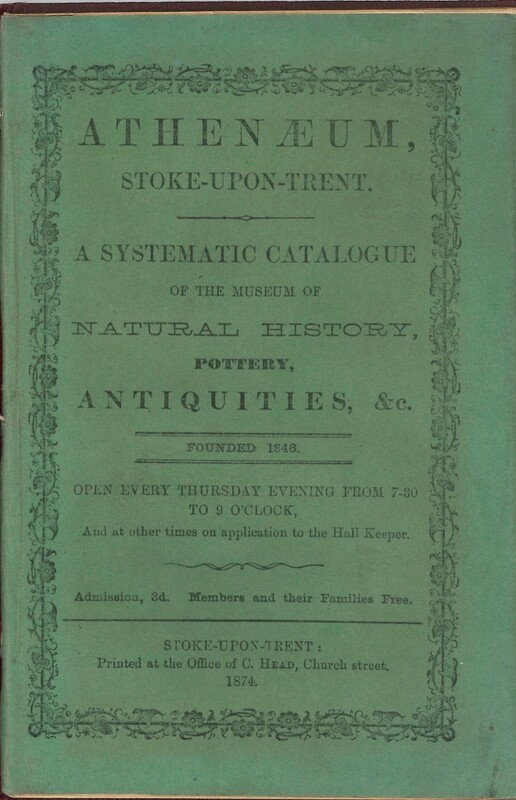 1846: Stoke-upon-Trent Athenaeum collection founded. 1847: A Potteries School of Design opens, with two centres (Hanley and Stoke). 1850s: Minton encourages many fine artists to move to Stoke-on-Trent to work in ceramics. 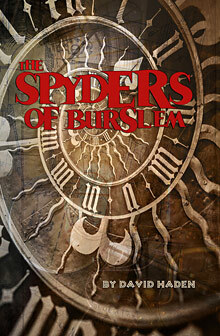 1853: Burslem School of Art starts. 1857 onwards: “Stoke School of Art, a government training school taken under the wing of the South Kensington Museum when it opened in 1857″. Located on the London Rd, Stoke town. Lasted until 1945? 1869: Burslem School of Art moves to the new Wedgwood Institute in Burslem. mid 1800s: There is a mention of a “Hanley Art School” in the online record. This is probably shorthand to refer to the street in Hanley now known as Pall Mall. In the mid-late 1800s Pall Mall was said to contain… “The Free Library, the North Staffs. Technical and Art Museum, the Government School of Art, the Potteries Mechanics’ Institution, and the Theatre Royal”. 1880s onwards: A critical mass of talented and trained artists are at work in the local pottery industry. 1884: The seminal realist novel The Mummer’s Wife (1884) establishes working-class Potteries life as a fertile literary setting, and directly inspires Arnold Bennett to write his Five Towns books. 1888: H. G. Wells begins the earliest drafts of The Time Machine (in final form in 1895) at Basford. He is strongly inspired by the Potteries landscape, his first experience of an industrial district. 1888: The first North Staffordshire Triennial Musical Festival, though only for one day. 1904: North Staffordshire Symphony Orchestra started. 1907: Purpose-built Burslem School of Art opens. 1910: Four local museums federated in the County Borough of Stoke-on-Trent. 1930s: The flowering of recognisably modern designs, in both shape and pattern, in the local ceramics industry. Women designers start to become more accepted. Serge Chermayeff preaches the values of European Modernism, in a series of lectures in Stoke-on-Trent circa 1935. 1932: The Society of Industrial Artists founded in Stoke in October of that year. SIA… “is now beginning to develop local branches, of which the one at Stoke-on-Trent seems to work very effectively”. May not have lasted beyond 1939. Sounds like it might have been a communist front group? 1933: The Society of Staffordshire Artists (SSA) was founded in 1933 (some sources say 1934), after much discussion between three principal local art groups: the North Staffordshire Art Society, the Staff and Student Society of the Stoke on Trent Art Schools and the New Group. 1930s: Many refugees, fleeing Nazism in Europe, come to Stoke-on-Trent to offer their creative talents to the pottery industry. Such as Grete Marks and others. 1941: Borges’s famous story “The Garden of Forking Paths” is set in Fenton, Stoke-on-Trent. 1944: Publication of Music in the Five Towns 1840-1914: a study of the social influence of music in an industrial district, Oxford University Press, 1944. 1945: Stoke-on-Trent Regional College of Art formed, a confederation of existing art schools at Longton, Burslem, and Stoke town. 1956: First local council museum opened in the city. 1965-72: Golden Torch, a famous Northern Soul and mod nightclub in Tunstall, Stoke-on-Trent. 1971: Stoke-on-Trent Regional College of Art merged into the new North Staffordshire Polytechnic. 1974: In September 1974 the art-house cinema The Film Theatre is established in Stoke-on-Trent (still running at 2014). 1975: “Power Over The Clay” (Ray Johnson, 1975. 40 mins). The first local colour screen documentary of the history of the Potteries. 1979: Arthur Berry‘s Lament For The Lost Pubs Of Burslem broadcast on national radio and published in The Listener. Around this time Arthur is also profiled by a number of TV documentaries. 1980: The Stoke band Discharge release their first E.P. “A defining moment of British punk … between 1980 and 1983 Discharge stood among the standard bearers of [the] punk movement” — Journal for the Study of Radicalism. 1981: The current Potteries Museum & Art Gallery at Stoke-on-Trent opened by the Prince of Wales. 1980s: The city features in b&w photography made by Paul O’Donnell. 1985: Beavers (Beavers Arts, later B arts) community arts group starts. 1985: Ray Johnson begins work on what will become the Staffordshire Film Archive. 1985: Charles Tomlinson Reads His Stoke Poems audio cassette released by Keele University. 1986: The Conservative government, initially aided greatly by local Conservative councillor Cyril Finney, bring the National Garden Festival to Stoke-on-Trent. The Festival was held on the site of the former Shelton Steelworks, which was closed as a steel producer under Labour in 1978. 100 sculptors had their work shown on site, including the later-famous Antony Gormley. The Curator was Vivien Lovell. A major photographic series on the Festival was from Mike Berry. Though dogged by wet weather, the Festival very effectively triggers the start of the city’s 30 year regeneration. Early 1990s: Stoke-on-Trent becomes a major centre of the international rave music scene, around small clubs such as Delight (Lazerdome). Music by the Stafford-based band Altern 8 (recorded in Stoke at Baseroom Productions, later purchased by Birmingham’s Network and sold to Sony) effectively marks the ‘high point’ of the scene. Altern 8 regularly play nights in Stoke, and Pete Bromley was a regular DJ. 1990: The Cultural Quarter is proposed in the Council report A Cultural Strategy for Stoke-on-Trent (1990). 1990s start? : Various community arts groups. 1995: Cultural Sisters community arts groups starts. 1997: Letting in the Light community arts groups starts. Mid 1990s? : Disused Burslem School of Art crowbarred open by Torben Franck and other artists, followed by official recognition and refurbishment as gallery and studios/offices. Mid 1990s? : Frink School of Sculpture starts in Tunstall. Trained many sculptors, before closing in the early 2000s. 1990s? : North Staffordshire Arts and Architecture group met regularly. Meetings effectively finished circa 2005. 1997: Mark Fisher, Labour M.P. for Stoke-on-Trent Central. Interested in the arts from 1987 through 1997, and as a consequence was appointed as a junior Arts Minister between 1997-8. Dropped from government in 1998. Late 1990s: Under the auspices of Councillor Ted Smith (Labour) the “Cultural Quarter” is established along Piccadilly in the city centre, between the Potteries Museum and the Regent Theatre (opened 1999). The Victoria Hall re-opens for concerts. In the years that follow there was as growing local debate and derisory sentiment about the Cultural Quarter — and a knock-on national media fallout for the city, arising from that local debate. 2001: A low point in Stoke’s cultural history — the national press and media commonly refers to the city as “a cultural desert”. Post of city Arts Officer allowed to lie vacant by City Council. The independent Creative Stoke website starts, to try to show that there is creative life in North Staffordshire. 2001: Stanley Matthews statues installed Oct 2001 at the Britannia Stadium, Stoke-on-Trent. Artists: Julian Jeffery, Carl Payne and Andrew Edwards. Early 2000s: Staffordshire University, closure of Glass degree course. Mid 2000s: Several arts business incubators established. New live/work units for artists next to the Burslem School or Art. Creative Village incubator at Staffordshire University. Burslem School of Art becomes self-funding, with great success. 2005: George Thomas Noszlopy’s monumental survey book Public Sculpture of Staffordshire And the Black Country appears. 2006: AirSpace Gallery starts, aimed at graduates of recent Fine Art degrees, with Arts Council England funding and associated studios. 2007: Publication of the comprehensive survey book Oil paintings in public ownership in Staffordshire. 2009: The year of the first British Ceramics Biennial, a major ongoing contemporary ceramics festival. The focus was on contemporary and fine art works in ceramics. Circa 2011? : Staffordshire University, closure of the M.A. Fine Arts course. 2014: Creative Village business incubator set to be closed down at Staffordshire University. 2016: UK City of Culture 2021 bid prepared. 2016: the Spode site, a former ceramics factory in Stoke town, opens a refurbished section serving as dedicated artists’ studios. 2017: In mid July, Stoke-on-Trent is shortlisted for UK City of Culture 2021. This is a very early provisional draft list and will be updated.